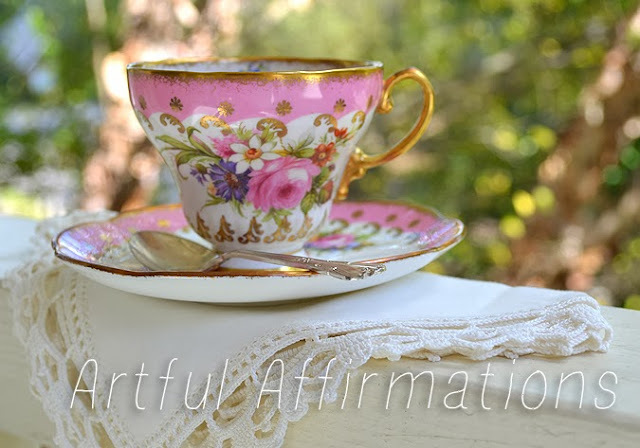 Artful Affirmations: Tea Cup Tuesday-Favorite Tea Cups of 2013! The above cup...a pretty Foley cup, from 1948-1963. I found her in Savannah last summer. One of my favorite Paragon tea cups. The gold trim is elegant and the lovely fruit and flowers so cheery. She is a regular at my tea table. This calm aqua cup always looks lovely. She is a Foley as well as the first cup. Her quiet beauty suits a summer day. And of course this sweet little Rosina cup. Pure vintage sweetness in a waisted footed cup. All my cups are my favorite though. Lol! I am hoping this summer will be more amenable to my tea tent Bertha. There were only a few times I was able to put her up and enjoy. Hopefully this year she will get plenty of use! Do you have any special tea party plans this year? Here is to many lovely tea parties in 2014! These are all incredible! The insides are just as pretty as the outsides! Terri, I too love those teacups. Each one is an exquisite work of art. I love aqua and pink and the Paragon dressed in all her golden splendor is stunning. Thank you for sharing some favourites and have a beautiful day, my friend. Great retrospective of teacups. I love the Foley as well...I have a penchant for fruit teacups! Thanks for hosting and have a great week! "Washoku" traditional Japanese cuisine was added to UNESCO's Intangible Cultural Heritage list Wednesday, raising the government's hopes of enhancing its global recognition, attracting more foreign tourists and boosting exports of the country's agricultural products. such beautiful cups all,-I love the pink ones most :-) but also the aqua one with the beautiful flowers goes as pink ;-) .... I have wondered how big a collection you have ,of all sorts of stunning tea-cups. I so hope you can sit in your lovely tent, the coming summer, Terri- I would love to have tea with you there !! I love teacups with strawberries on them! Yours is lovely! 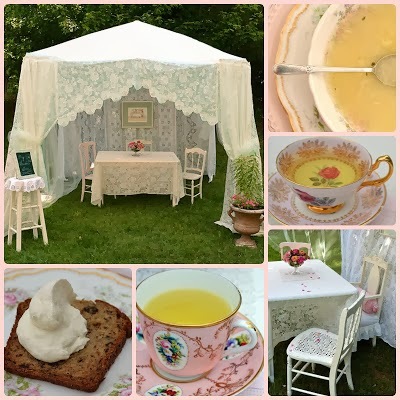 I am planning a Mad Tea Party in July and I love your tea party tent. I might try that this summer! It would be amazing! I drool looking at your teacups Terri, they all have their own special qualities, but that aqua color is really pulling me! I hope you get to use your tent more this summer too, I will be watching and waiting! Blessings, Terri! Such an excellent selection - I think I like that little Rosina best. You should do a post on where you keep them all sometime. I am often challenged with making "safe" storage space for them and am thinking I may need to scale back a few to make room for any new 2014 treasures that may come along. We shall see. However - your Bertha brought back warm memories of summer tea posts. Looking forward to her again - on a windless sunny day. you have a beautiful collection. Each one is a treasure and very very outstanding. Cant tell, which I like best. It was really a pitty that you couldn't use this romantic tea tend only a few times. Hopefully the upcoming summer will be better. I would love to attend you in this fantastic tea tend. 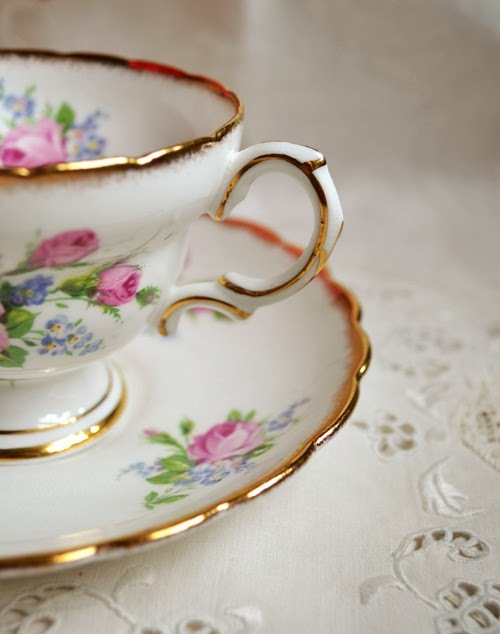 Thank you for sharing and hosting this tea time. I think I shall have to look for a Foley teacup, they have a nice design and patterns. I hope to see more of your chic Bertha tent again this year, I love it. True, choosing a favorite tea cup is like choosing a favorite child. Although, that pink floral Foley cup is exquisite! What a fabulous find. It looks like it was a very good year full of wonderful memories. Here's to many, many more. Happy 2014! Hi Terri! The first cup is magnificent! A queen among cups! Could I please have that one if we ever have tea together? That would be so nice! I always have ideas and goals for special tea parties with my 6 granddaughters, my friends, and my husband. Your tea tent is perfect for your tea times, and we too have a tea tent we have used for a few years . The tent has been our venue for barbecues, tea parties, and quiet breakfasts together on warm summer mornings. 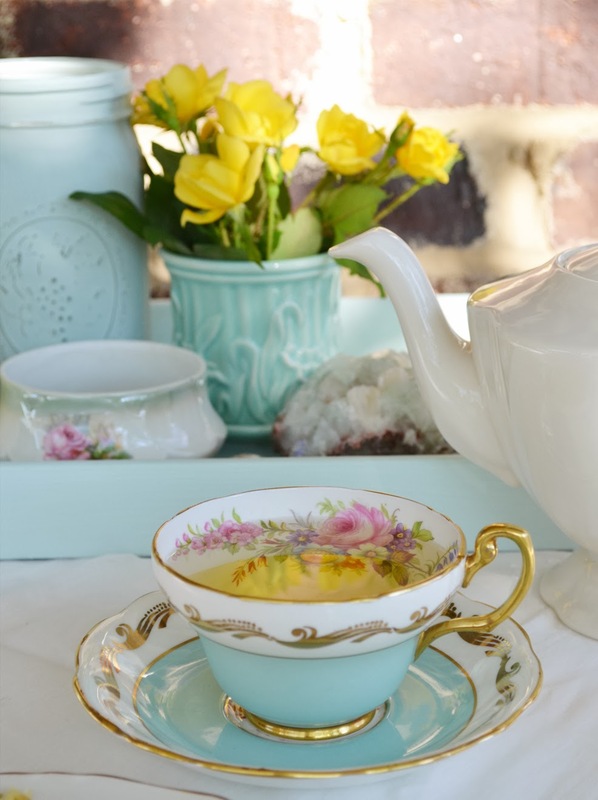 I am always inspired by your blog posts Terri, and the teacups you've featured are are so beautiful. 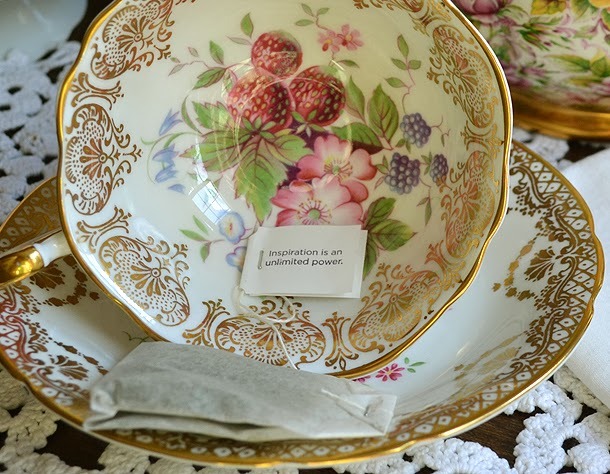 I especially love seeing tea time posts that show the featured teacup is actually used and even possibly shared with someone . Thank-you. I wouldn't be able to choose one of your teacup as my favourite! They are all so delicate. I'm looking for Foley teacup now as well in flea markets, but haven't had any luck yet! I don't know how you ever choose a cup to use!!!! They are all so pretty and special. Bella tu vajilla, tu taza de té rosada y celeste. Espero que tu verano venga con todo lo bueno para tu tienda tan romántica y refinada. Your favorite cups are absolutely stunning and I can see why you have them! Can't wait till warm weather comes back to see your pretty little outdoor tea sanctuary again! Hi Terri, I love your beautiful tea part marquee and what a cute name she has. Such a nice space to entertain friends and families and share a cuppa. Thank you for beautiful tea parties last year and looking forward to more fun afternoon teas. Each of your tea cups is pretty and I like the berries in the interior of that first cup, and the idea of your tea tent soon being up.